The freshness of the air in your home has a huge impact on the health of anyone inside it, particularly the elderly, or anyone who already has breathing issues such as asthma. The best way to ensure that your family has the freshest air possible is with our variety of excellent services! Our experts have the knowledge needed to determine the best solution for any issue and implement it right away so you’ll have a cleaner home before you know it. There’s no need to choose between services that are quick or high quality when you can have both with our company! Our professionals understand that, while you want things done swiftly so you can get back to your busy schedule, you still want the best possible work done on your home. That’s why our team works hard to provide fantastic service while still having it done faster than you’d think. You’ll be back to normal with better air in no time. Our experts will treat your home like it’s our own and be careful to provide the best service possible, no matter if the project is something small or more extensive. That’s because our first priority is ensuring that our customers are satisfied with a job well done. Using the best equipment and years of experience, you can count on that with our company! Our team doesn’t do quick fixes that won’t last long, just solid and trustworthy work. Over the years, your dryer’s vent is bound to clog up with lint. This is a big problem for two reasons, safety and energy efficiency. The lint can catch on fire due to the high temperatures and spread to the rest of the home, which is the main reason that clearing it out periodically is so important. The blockage also makes it much harder for your clothes to properly dry so it will run longer and waste energy. Our professionals will thoroughly clean out your dryer’s duct so you won’t have to worry about either issue! While you may not consider it often, your home’s crawl space is home to a number of important components, from cables that provide electricity to the pipes that run water through your household. This is why it’s important to keep the area clean and check periodically for signs of rodents or other animals trying to make themselves at home. 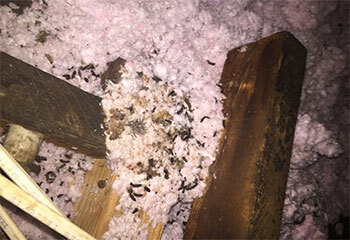 Dirt in the crawl space will entice more pests who may chew on cables and damage the area, as well as bring in moisture to cause mold and rusting of pipes. Our experts can clear out dust, debris, and much more! Leaving your air ducts untouched can allow pounds of dust and debris to build up in them over time, which lowers their energy efficiency drastically due to making it harder for air to pass through. This means your air conditioning and heating will have to run longer to compensate, thus wasting energy. More importantly, the materials in the duct will also pollute the air itself, thus drastically lowering the quality and causing health troubles. Rather than risk it, let our team clear them out for you before you know it! They'll be perfectly clear thanks to our specialized suction tools. While rodents in the home can cause a lot of damage and risk of disease from their waste, using pesticides to deal with them can be just as harmful. Pesticides can hurt more than just the rodents, particularly if you have pets in the home. Too much pesticide can also lower the air quality and cause health troubles in your family. That’s why our company offers a far safer and humane method by trapping the rodents and removing them from the home. There’s no killing, and your home will be rodent free quickly and easily. Rodent proofing is available too. Our company offers more services to help improve the air quality in your home and ensure that your family is breathing fresh, clear air! The best way to get started is with an air quality test. This will not only tell you how your air fares in terms of quality, but will give you specifics on what’s in it that is lowering the quality so you can actively work to change it. Our professionals can also take care of duct sanitizing and vent cleaning to thoroughly get rid of any contamination from pests or mold. Assure clean air today! Take a look here below for our latest projects! This customer needed rodents removed from her business. Learn more here! 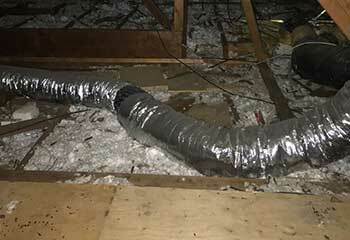 This customer’s ducts were damaged and needed to be tended to right away. Find out more here. 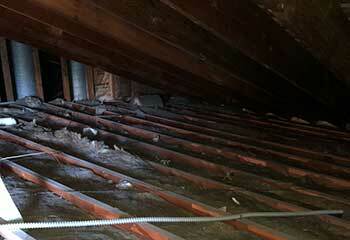 Our professionals took care of proofing this customer’s home against rodents in no time. Discover more here. After I found out I’d had rodents in my air ducts, I wanted to be sure they were clear of any diseases left behind. Your team was perfect from start to finish! On-time, friendly and affordable! My kitchen’s exhaust hoods were in desperate need of cleaning, and I’m happy that I found you guys to do it! It was done super-fast so my kitchen could get back to business. You guys are definitely the best place to go to for getting HVAC units cleaned! Everyone I spoke to was so polite, and you guys got it done in no time. Thanks!